The entire universe is composed of the Panchmahabhuta (five basic elements). The five fingers of our hands represent these five basic elements of the universe. The thumb represents element of fire; the index finger represents the that of the air, the middle finger represents the space, the ring finger represents the earth, and the little finger represents the element of water. These five elements are present in our bodies, just like they are in the universe. One can maintain the balance of these elements in our bodies with the help of the Yog Mudras. We unknowingly perform mudras (hand gestures) in our daily chores as the one we use when we say, ‘Beautiful!’ We express our emotions through our hands by positioning fingers and thumb in a certain pattern. We, Indians, use and move all of our five fingers to eat a meal – this is a Mudra as well. Indians tend to flex their fingers easily as they eat with their bare hands. The movement, thus, brings about the union of the Panchamahabhutas. 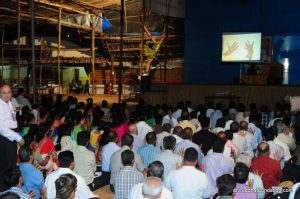 The peculiar gestures of our fingers while offering Naivedya, performing Sandhya, performing Pranayam, taking Teertha and doing Achman etc. are Mudras too. 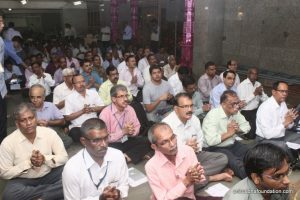 Besides, the Namaskar we perform by joining palms of both the hands together is one of the significant Mudras. Our body contains a lot of Naadis (flow of energy or current) otherwise means the pulse or nerves, that branch out to the apex of our fingers. These are connected to the Saptachakras. Hasta mudras (hand gestures), invigorate the flow of energy in our body and performing these in a specific sequence, will regulate a balanced flow of energy from Muladhara Chakra to Sahastrahar Chakra. The troubles or illnesses are caused due to the imbalance of the Panchamahabhutas. As our fingers represent the Panchmahabhutas, various mudras are formed by using them. Hence, by performing the mudras, we can regain balance in our body and free the mind and body from any illness. Thus, these Mudras play an active role in healing us physically as well as mentally. Sapta Mudra – As such there are many Mudras. However, Sadguru Bapu has specifically included seven mudras related to the seven chakras in our body in training. Mudra training – As per the instructions of Sadguru Bapu, Mahadharmavarman Dr Yogindra Joshi, took up the responsibility of training and provided two days of training programs free of cost. Initially, trainers were selected and groomed to impart the training after which the training was provided across various centres of Shree Aniruddha Upasana Foundation. Interested Shraddhavans can apply for this course at the nearest Upasana Centre. This course was also conducted on two consecutive Thursdays at Shree Harigurugram (New English School, Bandra) which benefitted thousands of Shraddhavans.